While PG&E’s average residential bills are well below the national average, we understand the critical importance of keeping gas and electric service affordable for our customers. This drives our continued focus on energy efficiency, helping customers gain greater control over their energy costs, supporting reform of residential electric rate structures and collaborating to address pressing issues, such as California’s drought. We are working in a variety of ways to ensure that the gas and electricity we deliver to nearly 16 million people is not only safe and reliable, but also affordable. This includes an ongoing focus on achieving efficiencies in our operations, offering ways for customers to save money by saving energy, and working with customers who are facing financial challenges. 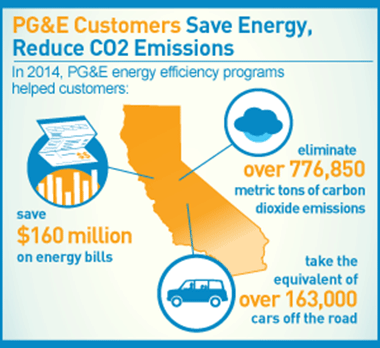 PG&E helped customers save $160 million on their energy bills through energy efficiency programs in 2014. Offering a full range of energy efficiency programs is one of the key elements of PG&E’s overall commitment to affordability. Our website includes an extensive set of energy-saving tips and lists of appliances and equipment that are eligible for rebates, as well as opportunities to upgrade the entire home. It also provides tools like Home Energy Reports that help customers analyze their usage and pinpoint ways to save. PG&E also provides customers with rate plan choices to help lower their bills. Residential pricing options made possible by SmartMeter™ technology are helping customers better control and reduce energy costs. The SmartRate™ Summer Pricing Plan enables customers to save money by conserving power during as many as 15 SmartDays™ each summer, when energy may be in short supply. More broadly, time-of-use-rates enable customers to save money by reducing and shifting some of their usage to lower cost off-peak times of day. California Alternate Rates for Energy (CARE), which offers a monthly discount on energy bills for income-qualified households and housing facilities. Qualified households receive a discount that currently averages about 37 percent. Energy Savings Assistance Program, which provides income-qualified renters and homeowners with free energy education, weatherization and energy efficiency measures and appliances to reduce gas and electricity use. Balanced Payment Plans, which spread costs out evenly over the year and eliminate swings in customers’ monthly energy bills from seasonal changes in usage. Relief for Energy Assistance through Community Help (REACH), which provides emergency energy assistance of up to $300 to low-income customers experiencing a crisis that prevents them from paying their gas or electric bill. This one-time assistance program, funded in part with charitable dollars from PG&E’s shareholders, is administered by The Salvation Army. Worked to continuously adopt more efficient technology and work methods. We remain focused on initiatives to streamline processes and decision-making, which enables leaders to more effectively develop the strategies that support our core business needs. One example is our corrective action program, which is empowering employees to make a difference. Continued to support residential rate reform. We support reform of residential electric rate structures and advocate for a simpler system of rates. Our proposal includes simplifying rates, bringing them closer to actual energy costs and supporting informed customer choice with an optional time-of-use rate. Enabled and promoted energy savings in creative ways. “Energy House Calls,” a reality show where PG&E customers get a home energy makeover, is one way to showcase the value of energy efficiency. Another example is the Energy Savings Assistance Program, highlighted at an event in Bakersfield, which allows income-qualified customers to make their homes more energy efficient. Collaborated to address the drought. As California faces the worst drought in decades, we are working with customers to help them save energy and water. Much of this work is directed at farmers, ranchers and other agricultural customers. For example, in the City of Lemoore, PG&E hosted a workshop to inform agricultural customers about various programs, such as rebates for installing more efficient water pumps. Farmers and ranchers have shared their experiences working with PG&E. CARE: Over 1.4 million customers, or 86 percent of those who were eligible, received discounts through the CARE program in 2014. We partnered with more than 70 community organizations to enroll customers throughout our service area. Since the program’s inception in 1989, PG&E CARE customers have saved nearly $7 billion on their energy bills. REACH: PG&E provided over $1.4 million to help more than 6,100 customers through the REACH program in 2014. Balanced Payment Plans: Approximately 253,000 customers took advantage of various balanced payment plan options in 2014, which helped even out the highs and lows of monthly bills. PG&E’s Energy Savings Assistance Program helps income-qualified customers reduce energy use, better manage energy costs, and increase safety, health and comfort through a mix of energy education and energy efficiency measures. The program includes measures that reduce lighting costs, provide weatherization to reduce air flow in and out of the home and help customers reduce water use, which is of critical importance given the state’s drought. Average PG&E residential bills for gas and electric service are among the lowest in the nation, according to figures compiled by leading trade associations. 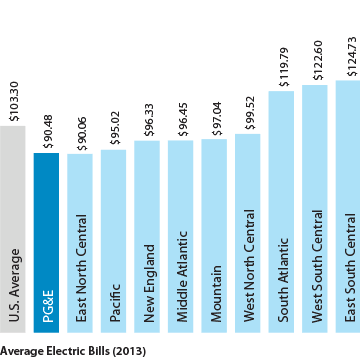 PG&E’s residential electric customers paid less than the average of nearly every region in the country in 2013, the most recent year for which comparative data are available. Their average bill of $90.48 per month was 12 percent less than the national average of $103.30. The average PG&E residential gas customer paid $39.75 per month, or just over a dollar a day, which was 34 percent less than the national average of $59.83. 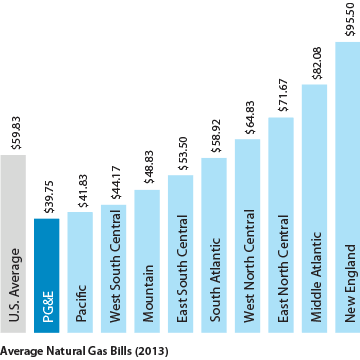 Several factors contribute to low average bills, including our region’s relatively temperate climate, which limits the need for winter heating and summer cooling; robust energy efficiency programs, which save customers money; and slower growth in PG&E’s gas and electric rates relative to inflation since the start of the last decade. PG&E is focused on keeping energy affordable for all our customers. We will continue to work proactively with regulators, state officials and other stakeholders to make our rates as fair and equitable as possible. Energy efficiency measures also will remain at the heart of our efforts to help customers save money on their bills. 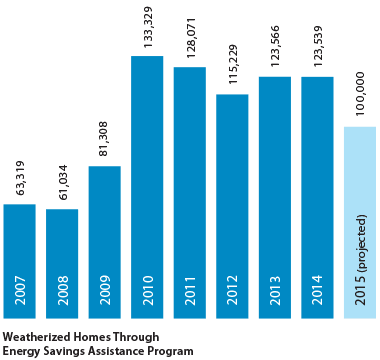 For example, in 2015, PG&E has set a target to weatherize 100,000 homes through our Energy Savings Assistance Program. We will also work to continue increasing CARE program enrollment.